Juan grew up working as a shepherd in the Castile region of Spain. He led a wild and misspent youth, and travelled over much of Europe and north Africa as a soldier in the army of Charles V, and as a mercenary. Fought through a brief period of insanity. Peddled religious books and pictures in Gibraltar, though without any religious conviction himself. In his 40's he received a vision of the Infant Jesus who called him John of God. To make up for the misery he had caused as a soldier, he left the military, rented a house in Granada, Spain, and began caring for the sick, poor, homeless and unwanted. He gave what he had, begged for those who couldn't, carried those who could not move on their own, and converted both his patients and those who saw him work with them. Friend of Saint John of Avila, on whom he tried to model his life. 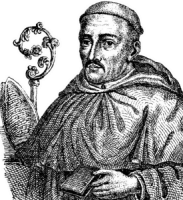 John founded the Order of Charity and the Order of Hospitallers of Saint John of God. If we look forward to receiving God's mercy, we can never fail to do good so long as we have the strength. For if we share with the poor, out of love for God, whatever he has given to us, we shall receive according to his promise a hundredfold in eternal happiness. What a fine profit, what a blessed reward! With outstretched arms he begs us to turn toward him, to weep for our sins, and to become the servants of love, first for ourselves, then for our neighbors. Just as water extinguishes a fire, so love wipes away sin. Apparently born to a Christian farm family. Educated by Saint Naul and a saintly monk named Cassidan. Monk at Kilmanagh (Kilkenny), Ireland. Founded a monastery at Enniscorthy, Ireland. Pilgrim to Rome, Italy and to Tours, France, a center of monasticism at the time. Founded several churches and monasteries including houses at Iniscarra, Ireland. Spiritual teacher of Saint Aiden of Lindesfarne. Aquaintance of Saint David of Wales, and friend of Saint Cannera of Inis Cathaig. In later life he retired to Inish Cathaig (Scattery Island) on the river Shannon; the river is believed to have been named for him. Bishop. Legend says that he chased away the Cathach, a type of monstrous sea serpent, from the island by ordering it, in the name of the Trinity, to depart. Born wealthy. Studied in France and Italy. Provost of the cathedral of Sandomir, Poland. May have been the principal of the cathedral school of Cracow, Poland. Bishop of Cracow from 28 March 1208. Worked to reform the clergy and invigorate the laity in his diocese. Supported monasteries in Sulejow, Koprzywnica, and Jedrzejow. Peacemaker between Hungary and Poland over the area of Galicia. Vincent resigned his see in 1218, and became the first Polish Cistercian monk, entering the house at Jedrzejow. Noted writer, author of the Chronicles of the Kings and Princes of Poland. Monk. Priest. Met, befriended, converted and baptised King Sigebert who was in exile from East Anglia. When Sigebert returned to East Anglia in 630, he invited Felix to bring Christianity to his people. Felix was ordained bishop by Saint Honoratus of Canterbury, and then sailed up the River Kent, apparently starting his work in the area now known as Felixstowe. Evangelized throughout East Anglia, building a cathedral and school at Dunwich, stone churches throughout the region, and the college that became the University of Cambridge. With Saint Sigebert he founded the Bury Saint Edmunds abbey c.637. Worked with Saint Fursey. Spiritual teacher of Saint Audrey. Pious youth. Priest. Hermit with another priest named Pierre. The pair's reputation for holiness drew so many spiritual students that c.1134, with the approval of the bishop of Tulle, France, they founded a monastery composed of many small huts in the forest. The monks were noted for their severe austerity, and spent most of their time in prayer and study. Nearby at Coyroux they founded a convent for 150 nuns along similar lines. As there was no written Rule for the community, c.1142 Stephen joined the Cistercians, and the monks and nuns in the forest followed suit. He affiliated his house with the Cistercians in 1147, and served as abbot. The monastery was suppressed in the repressions of the French Revolution, and its property seized in 1791. The abbey church survives, and serves as a parish church. Immigrant to Constantinople. Studied under Saint Tarasius, Patriach of Constantinople. Sent by Tarasius to a monastery on the Bosphorus with Saint Michael the Confessor. Monk. Established hospices for travellers, and worked with the poor, widows, orphans, the mentally ill, the blind, lame, and sick. Bishop of Nicomedia (part of modern Turkey). Opposed the Iconoclasm of Emperor Leo V of Armenia; banished by Leo to the fortress of Coria, and imprisoned for the last 35 years of his life. Educated in Ireland. Bishop of Ross, Scotland. Spiritual student of Saint Ambrose of Milan. Co-adjutor to Saint Felix, bishop of Como, Italy whom he succeeded as bishop in 391. Monk. Abbot of Irache Abbey in Ayegui, Spain. Counselor to King Sancho Garcés IV of Navarre and King Sancho Ramírez of Navarre. Spiritual student of Isleifur, bishop of Skalholt, Iceland. First bishop of Holar, Iceland in 1106. Great evangelist of the island. Actor and musician. Convert. Ordered to sacrifice to idols during the persecutions of Diocletian, he confessed that he was a Christian. Tortured and executed. Marytr. Christian ordered to sacrifice to pagan idols during the persecutions of Diocletian. Thinking that Saint Philemon of Antinoë was a pagan, he asked him to switch clothes and offer the sacrifice in his place. Philemon announced in front of the pagans that he was a Christian, too. Shamed, Apollonius confessed his faith, was tortured and executed. Martyr. Third-century governor of Thebes, Egypt. Having witnessed the courage of Christian martyrs, he became interested in the faint, and became a convert. Martyr. Benedictine monk at Prüm, Germany. Bishop of Thérouanne, France. Abbot of Saint Bertin Abbey. Cared for and supported his flock during Norman invasion. He had a special devotion to the feast of the Assumption of Our Lady. Layman. Having witnessed the courage of Christian martyrs, he became interested in the faint, and became a convert. Martyr. Bishop of Pavia, Italy from 864 until his death. Sixth-century bishop of Ardcarne, Roscommon, Ireland. Deacon in Carthage, North Africa. Companion in exile, biographer of, and witness at the trial and execution Saint Cyprian of Carthage. Monk. Abbot. Llanhrian, Wales is named for him. Martryed at Nicomedia, date unknown.